Ela Carte reviews Pure South..
Oh, I have been looking forward to this one. I enjoyed this eatery in its former incarnation; I loved the pop up that operated while their renovation was completed, and I raced in once this new, improved, two storey eatery was ready. In case you didn’t know, Pure South is all about Tassie and surrounds ? the farmers, fishers and artisan producers from our island state and nearby King and Flinders Islands. It seems such a simple and obvious idea given the plentiful bounty Tasmania has to offer, yet these guys have got the notion all to themselves. Just imagine ? oysters and scallops from St Helens, King Island beef, Scottsdale Farm pork and Huon salmon. What previously was very much a fine dining restaurant on a single level, now offers some variety in atmosphere over two levels. Downstairs is their ‘River Level’, a more relaxed drop-in eatery where you can sit in front of the open kitchen, or in the window with fabulous Yarra Views. The slow-cooked pork belly was super crunchy on top. To be fair, while the vibe is relaxed, the menu is still pretty swish looking. I imagined it would be a little cheaper and pared back when we popped in for a snack. For a meal proper, we headed upstairs to the ‘Dining Room’ ? a little more formal, but still simple and stylish, with smashing city and river views. It’s as expected ? excellent service and a mouth-watering menu. From unusual sounding broccoli doughnuts to melt in the mouth King Island beef cheek, there were no disappointments. The ocean trout tacos are good enough to order again. I’d already tried the house-cured ocean trout tacos, and they were good enough to order again. It’s Huon trout two-ways ? one cured and smoked, the other cooked at 60 degrees. 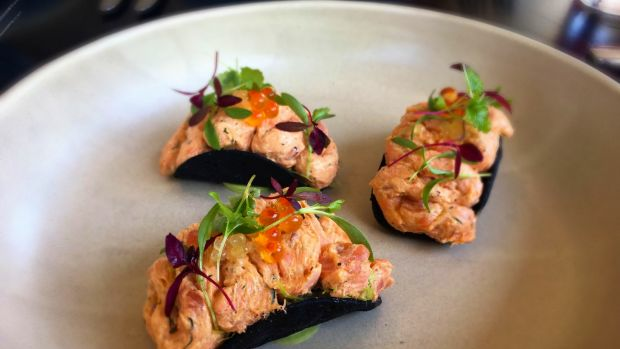 The fish is then mixed into a zesty rillettes with smoked paprika, mayo, cr?me fraiche, tabasco and lime juice and piped into a taco that’s basically a squid ink lavosh. It’s topped with some baby cos, salmon roe, finger lime lemon balm and micro coriander. They’re little, but they pack a punch. 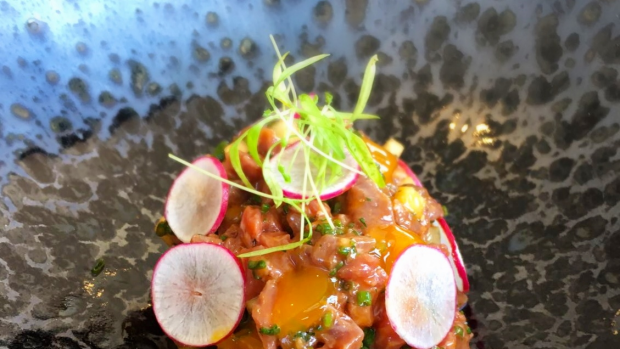 One of my yardsticks is always the beef tartare, and chef David Hall did not disappoint here. The King Island grass-fed beef is mixed with tarragon, ketchup, shallots, Worcestershire, tabasco, mustard and caper, then an egg yolk puree is added. It’s a cracker of a tartare. The beef tartare is a cracker. Sweet and sour pork is fun and pretty ? this ain’t no sticky Chinese dish. A thin slice of pork belly has been soaked in brine overnight, dried and then slow cooked for 12 hours, of course it was a super crunchy crackling on top. It’s served with pressed cucumber hearts, pineapple gel and reduction, red pepper emulsion, pork jus and white rice prawn cracker. Latrobe’s House of Anvers provided the fuel for dessert ? 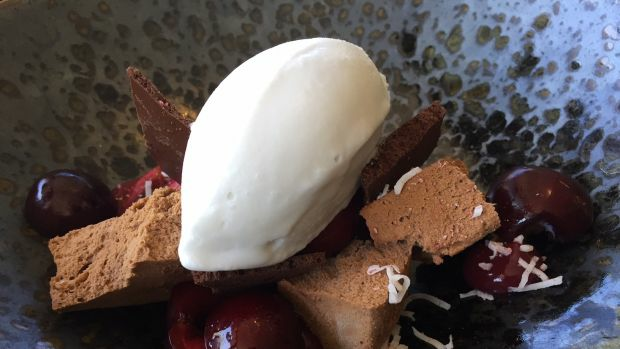 a stunning dark chocolate ganache with cherries macertated in red wine, cloves, cinnamon, vanilla and orange peel; stupendous aerated frozen chocolate mouse and a coconut cream sorbet. This was decadent and delightful ? not overly sweet and teeming with texture. What I love is the dedication behind this idea ? 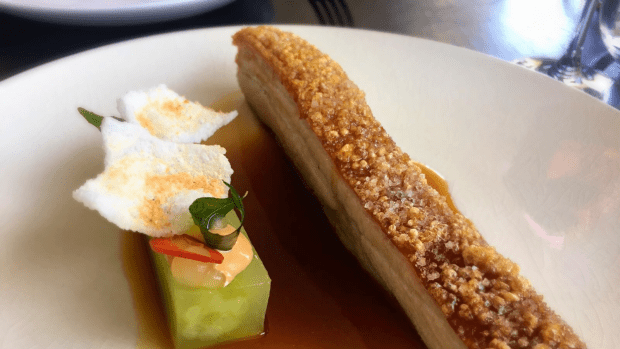 that you can form relationships with world class ethical and sustainable producers, get the freshest products available, and place in front of diners a state away inventive, top quality dishes that show why the effort is worth it. The dark chocolate ganache was decadent and delightful.